Goes to the Men's premier division league champion whether Canadian or from the USA. This cup was donated by the Wesburn organisation, now Burnaby Canadians. George Cambidge started with the Wesburn organisation in 1966 as a volunteer coach in the club's youth house league and continued coaching the same group of youngsters till they moved up through the system, eventually graduating from Youth Division One in 1978. He then worked with the Wesburn senior team until his untimely death at the age of 47 in April 1981. George Cambidge was a dedicated and hard working volunteer for the club and soccer. He was held in the highest esteem by all who knew him and was always willing to go the extra mile despite having to live for years with an artificial heart valve. The PCSL thanks Mr. Harry Etheridge of Burnaby, long time friend and coaching associate of George Cambidge, for providing this information. 1982 - Vancouver Whitecaps "B"
This is our Challenge Cup with the top four men's premier teams or the Host team and the top three competing in a straight knockout. Sheila Anderson was a former PCSL league secretary. This Challenge Cup tournament is one of the highlights of the PCSL season. 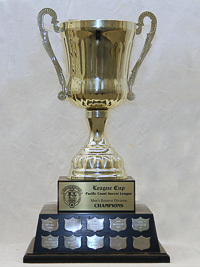 The original trophy was replaced with the current one in January 2007. Cup winners prior to 1995 unavailable. 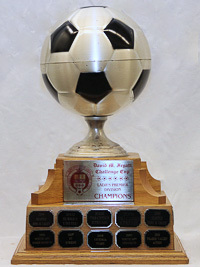 Originating in 1960, the John F. Kennedy Trophy (Kennedy Cup) was born out of an idea to have the annual international championship, which would be played for by a top calibre representative men's amateur soccer team from Canada, the United States, and Mexico. 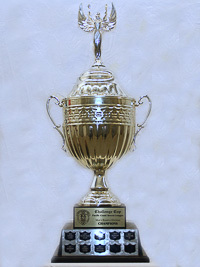 This trophy remains unique even today, in that it is the sole sporting award to which the late U.S. President ever lent his name. When the tournament was inaugurated in 1961, the late President Kennedy, recognizing the physical requirements in the sport of soccer, gave his name to the fabulous trophy in connection with his physical fitness campaign. The trophy was donated by Neil J. Hoedemaker of Hody's Restaurants. During the inaugural phase of this prestigious competition, the Mexicans dominated the scene, capturing 4 of the first 7 finals. The Vancouver Firefighters team won the Cup twice in 1962 and 1966. The underdog, Victoria O'Keefe's in front of 6,000 avid soccer fans at Empire Stadium, stunned Mexico, to become the last team to win the Cup under this format in 1967. 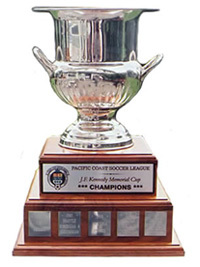 In 1989 the PCSL resurrected the Kennedy Cup tournament using a substitute trophy with the name J. F. Kennedy Trophy which is now contested by the Oregon State champions, the Washington State champions, the BC team in the PCSL which finishes highest in the league standings, and a chosen host team. 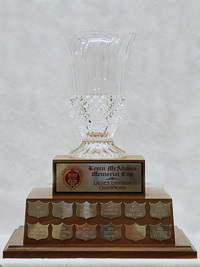 The original J. F. Kennedy Trophy remained in the custody of the Victoria Okeefe organization from 1967 until it was donated to the B.C. Sports Hall of Fame on November 25, 2009. 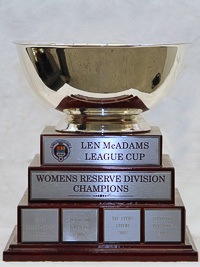 The women's premier division league cup whether Canada or USA is named in honour of a man who had a long association with the PCSL as Secretary/Treasurer and was instrumental in developing the Graduate League or as they are known now as the U-21 League. He was also heavily involved in church and community organizations. We were delighted to be able to honour our friend with the Jacques Moon Memorial League cup. 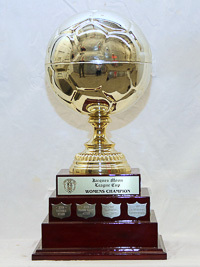 This cup was initiated in 1994 as the women's equivalent to the J. F. Kennedy Cup. The intent is to bring out the best of the Women's teams from Oregon, Washington and BC and as such was the forerunner of the present PCSL Women's Premier Division. Kevin was the son of Len & Yvonne McAdams who died tragically in an accident at the age of sixteen is and lovingly remembered by his parents as an avid soccer player. 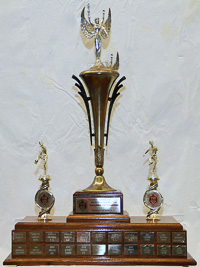 The founding clubs of the Pacific Coast Soccer League's Women's Under 21 Division (now the Reserve Division) donated to the PCSL a new Cup in 2006 to be presented annually to the side that finishes atop the standings in the Under 21 Women's Division. These four clubs (Tri-Cities Xtreme WSC, North Shore Girls SC, Fraser Valley Action and Semiahmoo SC) dedicated the new cup in honour of longstanding PCSL president and Life Member Len McAdams. 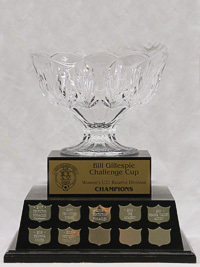 Named in honour of longtime PCSL director Bill Gillespie, this cup is awarded to the women's reserve division Challenge Cup tournament winners.